Like a cottage from a fairy tale, this enchanted log cabin is nestled deep within the forest, allowing its owners to find their happily ever after. 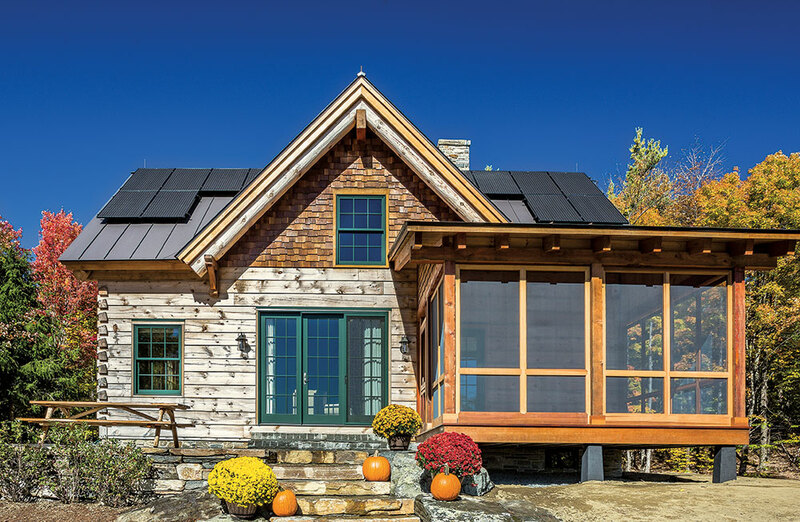 When Julie and Dave first purchased 250 acres of land, thick with forestry, high up in the mountains in central Vermont, their initial intent wasn’t to build two homes. However, after constructing a large primary residence with their builder, David Hill, from David Anderson Hill, Inc., they realized they weren’t fully utilizing their surroundings due to the rugged terrain. “One day, the kids wanted to make a trail — with machetes — and only made it about 30 feet,” laughs Julie. The couple enlisted their mason, Knight Ide, for help. Knight happened to harbor a passion for trail building and designed six miles of multi-use trails for the property, ideal for skiing, mountain biking and hiking. At the farthest point of one of the trails, he noticed the perfect spot for a cabin — a getaway from the getaway. He mentioned it to Dave, and what started off as a vision for an off-the-grid stone hut with sleeping bags and battery-operated LED lanterns, quickly turned into something much more sophisticated, but it still beat with the same rustic heart. “The plan was designed around a central hearth that serves as the cabin’s main heat source. 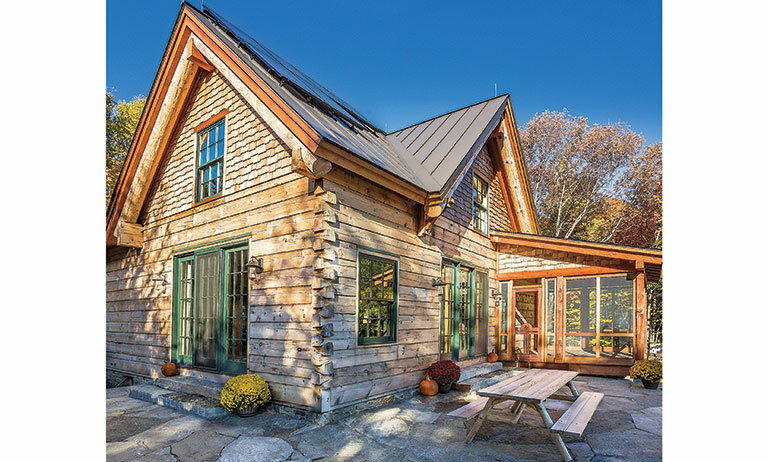 Low maintenance was a primary consideration, so the choice of a log building would accommodate that requirement,” says Jim Driesch, Real Log Homes’ director of design. With an inaccessible and highly elevated location, a handful of issues came along with the project, but thanks to David’s ingenuity, these obstacles were quickly turned into assets. For instance, to counter its remoteness, the cabin uses solar energy and has propane and septic tanks. “Most of the time, the solar carries the load,” explains David. A back-up generator kicks in when the sun isn’t shining or when the power usage exceeds what’s in the batteries. LED lighting and energy-efficient appliances help keep power usage low. With logistic challenges solved and the nuts-and-bolts of construction completed, it was time to turn to the fun stuff: The cottage’s interior details. Features like the wrought-iron railings, wall sconces and even roots that jut out of the wall are a nod to the cabin’s playful, enchanted forest theme. “At first, we looked at cut outs of pine trees for the railings, but it felt too Arts & Crafts-y,” says Julie. Dave had the idea of incorporating his love of literature into the design. “We have scenes from Shakespeare; The Hobbit; The Lion, the Witch and the Wardrobe; Harry Potter; Bambi; Snow White and others. Somehow it just all works,” beams Julie. The cabin has cedar shingles in the gables, eastern white pine logs, fir and cedar trim and a standing-seam metal roof. 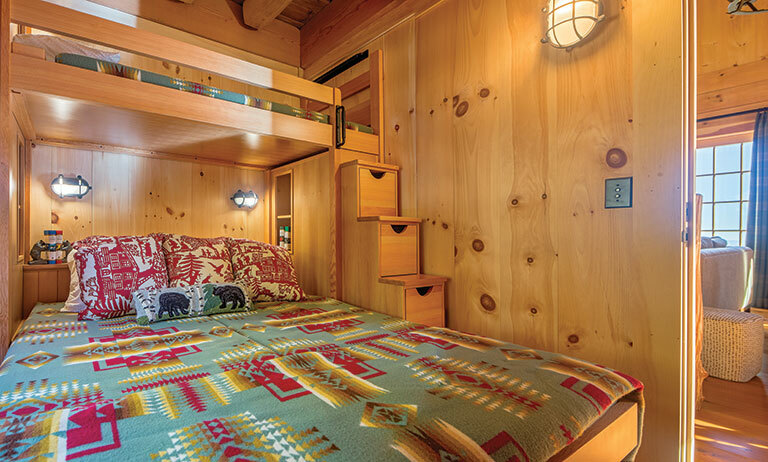 To maximize space, storage stairs lead to a sleeping loft in one of the cabin’s three bunkrooms. 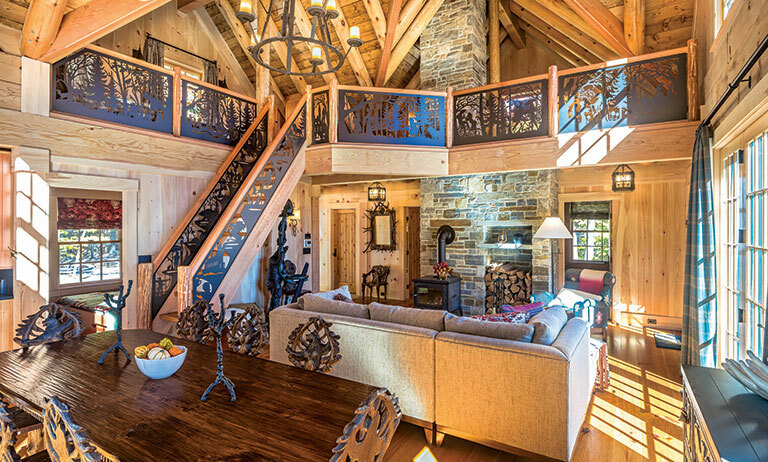 The great room, with a peak of 21 feet, shows off the 11-inch-high logs with dovetail corners. 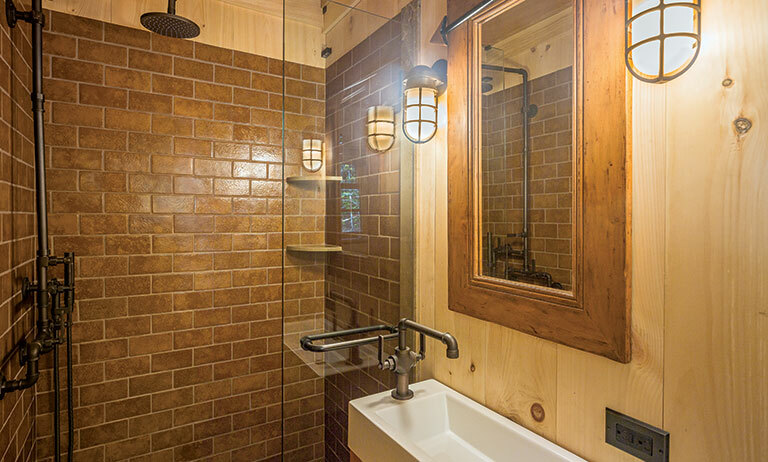 The pine log walls are left natural and have a pine trim sealed with a matte polyurethane. 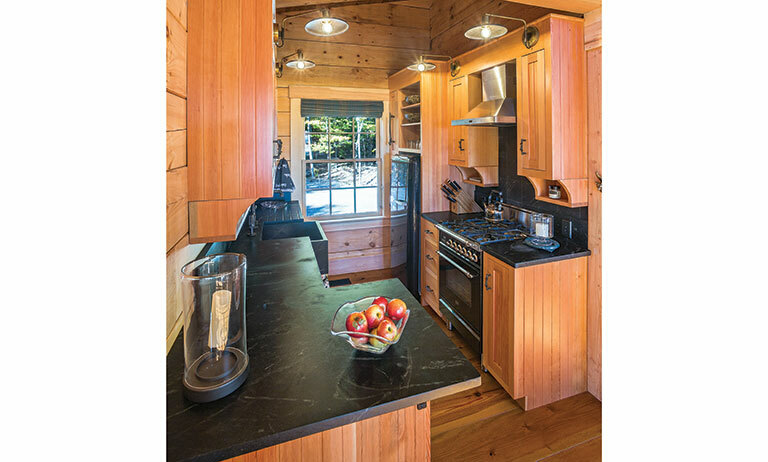 In the tiny kitchenette, Vermont soapstone complements the custom fir cabinets.